I've had a revelation this week! 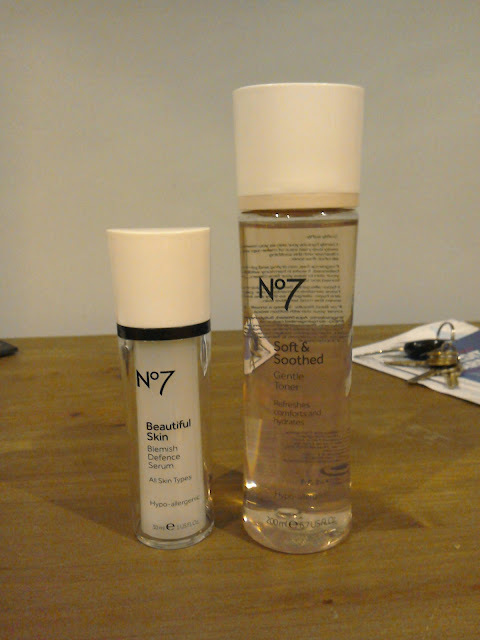 The No 7 vouchers are back again at boots 5 pound off skincare and 3 pound off make up. Being the kind of person prone to having bad skin due to breakouts I have tried so many skin care products its unbelievable! Creams, exfoliators, tea tree oils all claiming to do the same thing. After getting no joy out of these I opted to just cover with foundation which of course just causes a vicious cycle and makes the problem worse. Then I got one of these vouchers the other day and was having a mooch around the No 7 counter. I didn't really hold much hope as I haven't really heard much about serums. I soon changed my mind within a day of use it had helped my skin no end blemishes reduced and my skin just generally felt fresher than it had done in a while. I shall definitely be repurchasing!!! For anyone who has troublesome skin this is the skincare range you need!! !